New Orleans, the summer of 1853. Yellow fever ravages the busy port city. Bells toll for the souls of the dead. Boats on the Mississippi River are placed in quarantine, their cargoes left to spoil, their crews felled by disease. Before the summer is over, eight thousand people will die. I had a feeling months ago, that the cover would not be the only fantastic thing about this book and I was right. I picked it out as one of my Friday Finds and was lucky enough to get it for Christmas. If you put New Orleans, ghosts and the Lafayette Cemetery together, you will have my full attention. I am falling in love with anything New Orleans and desperately want to go there to see all the wonderful things this book talks about. The book moves forward from 1853 quite quickly and brings you into the present day, where Rebecca is sent to live with a distant aunt, whilst her father goes to work in China. She knows from the first day at her new school, that she has absolutely no chance of fitting in. Rebecca is curious about the in crowd and decides to follow them on their weekly nocturnal visit to the Lafayette Cemetery, where all their ancestors are buried. Concerned that she might be discovered by the group, Rebecca sets off in a run and heads straight into Lisette. Rebecca feels she has found a friend in Lisette, even if she is a ghost with a dark past. Whilst in town, Rebecca also attracts the attention of the dark and brooding Anton, who normally only dates girls from the in crowd. Why is he suddenly interested in Rebecca? Then there is all the commotion of the preparation for Mardi Gras, where Rebecca gets to play a vital part in the celebrations. I am not going to tell you any more, because if I do it will really spoil the story. 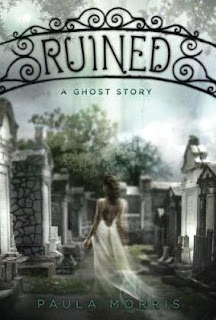 As I read my own description, the book sounds like another high school romance and from reading the first few pages I was worried that it may fall into that genre, but I was so wrong, this book is a lot darker and touches on lots of details of New Orleans history, recent as well as past. The book just got darker and darker as I continued to read it. I really loved this book and became completely immersed in the story quite quickly. There were lots of twists and turns in the second half of the book that I had no idea were coming and blew me away. Rebecca comes across as a feisty New Yorker, who is not about to let the most famous families of the New Orleans give her a hard time. She fights them tooth and nail until the truth is revealed. I loved reading about Lafayette Cemetery, which probably sounds a bit weird, but I suppose it is a little like our Highgate Cemetery over here in London, which is steeped in history and the resting place of many famous people, such as Karl Marx and George Eliot. I now need more books on New Orleans to quench my thirst for such a wonderful part of America. This book was a great start to 2010. Thanks for your views on this book. I've seen it reviewed on many other blogs and everyone seems to agree it's a good read though doesn't quite live up to the front cover. One I'll cetainly be reserving at the library if not actually buying. I read this in November (I think) and it totally made me want to go to New Orleans too. :) I think I would have loved this even more when I was younger, though...it didn't have enough complexity for me. I second Nymeth's recommendation of The Witching Hour for NOLA-themed books. Nymeth and Eva - I have got The Witching Hour. I picked it up with the next two books in the series from a charity shop. Can someone set up a New Orleans challenge to help me quench my thirst. I would, but I haven't a clue how to do it. Blodeuedd - the first few chapters are aimed at teenagers and I was worried it would stay like that but it was fantastic once I got into it. Petty Witter - best thing to do is get it from the library first. I've heard mixed reviews about this book and none from anyone I trust, so I hadn't put it on my list. I think I will now, thanks! I'm so glad you enjoyed this! I'm really looking forward to reading it now. What a tempting read! The cover is fabulous and the review is quite intriguing. I would LOVE to visit New Orleans, but it I can't for awhile, I can visit it in books! Oooh, I do like the sound of this, Viv. :D I love a good ghost story. Especially set in history. This is a great review - I'll be on the lookout for this one. This book sounds incredible! Thanks for a great review. I totally get your New orleans habit and if a New Orleans challenge DOES get set up please, please let me know :) This one is DEFINITELY going on my wishlist! Have you read Fevre Dream by George. R. R. Martin? That's a vampire one set up and down the Mississippi, loved it and my first book by him. Amanda - I hope you like it. Diane and Bermudaonion - you will love it. Laurel - I am desperate to go to New Orleans too. I think it is because I spent a lot of my teens working in a restaurant called Old Orleans which had the New Orleans theme, it has become ingrained in my brain. Suko and Ceri - thank you. Carmen - I haven't read The Fevre Dream but it is now going on my list. I shall take a look at that cookery blog, it sounds right up my street. Oh my! Sounds a bit creepy. I find it so interesting the places that pull people. I live in the States and have no desire to visit New Orleans, but I would love, love, love to come visit England--talk about rich history. I am so glad your book did not disappoint after having high hopes for it! New Orleans is such a neat city. I've been there twice and is a treasure for picture taking. What a great cover, and it does sound very interesting.. one to consider, I think!! You have me intrigued! Thanks for the recommendation. Sounds like a good one. I had a few issues with this one but I still enjoyed it. I plan on dragging my cousin-in-law over to New Orleans to see some of the places mentioned in the book. Ooo...what a interesting gothic novel! I'll have to save this one for the R.I.P. Challenge if I can wait that long. This does sound excellent, great review. I've read a few books set in New Orleans and when the author writes it well, its such a fantastic setting to a story.